To explain what I have included on this list, I will give you the criteria. I am making this list as basic as possible. Meaning that you can go to the grocery store and buy these items right off the shelf which means the items are shelf-stable. They will not expire or go bad easily. Most of these items will last beyond their sell-by or expired date if you wish. 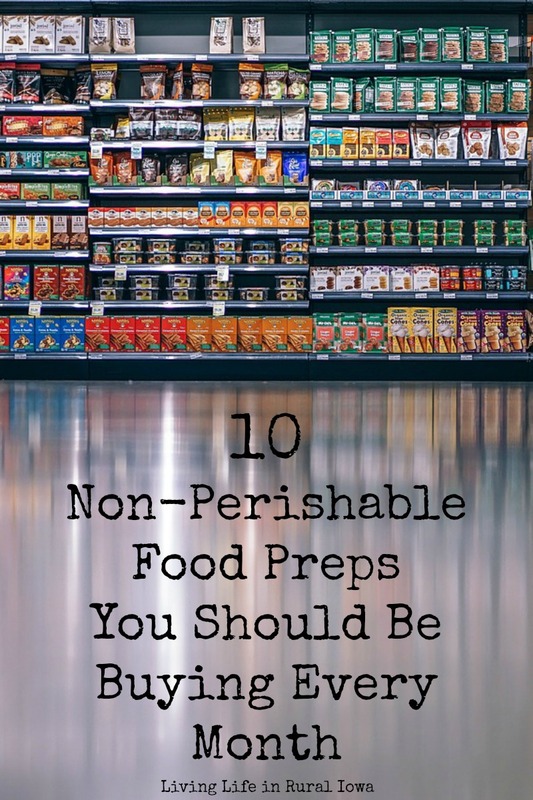 This list is simple and for beginning preppers. However, the more experienced preppers should take a look at this list too and see if they have holes they should fill in their food storage. If you want to, you can purchase these items in whatever manner suits you. If you wish to can them yourself, buy them in bulk, freeze-dried, dried, or whatever, you can certainly do that. If there is an item on this list you or your family does not eat, then replace it with something they do eat. Because the #1 rule in food storage is: Do Not Buy Food You or Your Family Will Not Eat! I don't care if you think "If we are hungry enough, we will eat it." That may be true, but why would you do that to yourself when you can simply purchase food that you will eat ahead of time! The quantity of each item to purchase each month is your choice also. Depending on my budget, I will only purchase 1-2 items each or I will purchase a case or flat of that item. I also have a continuous grocery list where I write down when I use up one item so I can replace it right away on the next grocery trip. For example, I use up a bottle of olive oil. I write it down on my list and purchase it on the next trip to the grocery store. If I find myself getting low on an item, I will do the same thing. 1. Salt and Pepper. Food without seasoning, bleh. You need at least salt and pepper to liven up your food. You can also stock up on other seasonings too. You might have ones you think you can't live without like garlic salt at my house. 2. Honey and/or Sugar. If you can live without these things, great. However, most of us cannot live without something to sweeten our drinks with. I also use sugar and honey in canning jams. Honey is also great for sore throats. 3. Beans. Dried or canned whichever you prefer. I like to use both, but in a hurry or being lazy, I will grab a can of beans first. So I stock up on canned beans. Beans are a meal unto themselves but are better with soups, chilis, casseroles, and one pot meals. They also help to fill people up and give energy. 4. Peanut Butter. This is packed with protein and fat which will help give you energy in a crisis. Beyond that, most kids and adults like it and will eat it plain or with bread/crackers. If you are allergic to nuts, look for a substitute like a sunflower butter or coconut butter. 5. Canned meats. As much as we would like to think we can raise our own meat or hunt your own meat when a crisis or situation happens, this may not be a possibility. Again, canned meat such as tuna, salmon, chicken, turkey, and ham will provide a good source of protein which helps give you energy in a crisis. 6. Canned tomatoes, fruits, and vegetables. While the nutritional value of fresh and frozen fruits and vegetables is better than canned, eating canned fruits and vegetables is better than eating junk. You can use these in casseroles and salads too. 7. Canned soups, broths, and meals. Sometimes when you have an emergency or crisis, the easiest thing you can do is open a can and heat up the contents. Even if you are in a hurry at night and need a meal, you can save money by opening a can of soup, heating it up, and have a quick meal. 8. Crackers and cereal. Many of you will not think this is necessary, but I have teenagers. Kids like cereal and they love crackers. My kids think saltine crackers and soup go together like peanut butter and jelly. Cereal can range from cold cereal to hot cereal. I like to eat oatmeal and will make it from scratch, but when I am in a hurry or just plain tired, the little packets are awesome. 9. Pasta and rice. Let's face it. There is very little nutritional value in pasta and rice. They are just carbs even if you buy the veggie pasta. However, they help to fill up the hungry stomachs and keep the teenagers from completely taking over the kitchen. They help to keep the meals budget-friendly. They are great to have on hand to make casseroles, soups, and one pot meals. They help to feed a large crowd during a crisis. 10. Coffee and Tea. Water is great for hydration, but it is boring. Most people drink coffee or tea in some way, shape, or form. I like to have a stockpile of coffee, various kinds of teas, and even some instant packets of coffee and tea. If coffee or tea is not your thing, look at getting some drink packets and/or mixes to liven up the water. 1. Oil. Whether you use olive, vegetable, coconut or other oils, they are good to have on hand and keep a good stock of. 2. Protein and cereal bars. Like I mentioned before, you can switch out items and customize this list for your household. Some things listed may not be something you would ever eat while some people could not store enough of that item because they eat it so much. This is a general guideline I use when I go to the store. This is so I can put a meal on the table whenever I need to without completely stressing out over the meal no matter what is going on. The meal may not be very exciting, but the consumers of the meal will not walk away hungry. Some of you will notice that I did not include such items as ramen noodles, various meals in a box, and macaroni and cheese. You can purchase these, but most of them have very little nutritional value, exceptionally high sodium levels, and feed very few adult people at one time. I don't usually include them in my food storage list for those reasons. However, if you want them in yours, you can certainly do that. What do you like to store in your food storage? What Are You Prepared To Live Without?